Fridge Friday Part I | Nicole, Deipnosophist. I jumped on the Fridge Friday bandwagon thanks to Amy. I actually took the pictures on Wednesday so I wouldn’t have time to clean and stage my fridges!! When I took the photos, I had to resist the complusion to turn all of the labels outward so it would be prettier. I didn’t do a fridge post on last Friday, so let’s start with the main fridge. Top left is dairy/soy; top right is homebrew for cooking, cooking wine, and big pots of leftovers (no leftovers this week, though!). The two small open shelves on the left are cheeses and eggs; the larger open shelf on the right is tofu and leftovers that are ready to be taken to work for lunch. The left drawer is “mire poix” (carrots, celery, green onions/shallots/whatever) and the right drawer is other fresh fruits and vegetables, currently packed full of hand-picked apples. The huge bottom drawer is unopened dairy and soymilk. It’s extra cold, so the stuff stays fresh for a long time. I can buy lots on sale and it doesn’t spoil! If you haven’t already stopped reading this very boring post, I’ll tell you what’s on the door by shelf, starting at the top: baking (e.g. yeast) and meds; butter; condiments; jellies; homemade hot sauces and jalapenos; and the bottom shelf is tall stuff and perishable, opened condiments. Still with me?? How about the freezer? Top shelf is, left to right ice (duh), limeade (for delicious margaritas not from a box, Mymsie! ), frozen bagged vegetables in the back row, and frozen homegrown produce in the front row. Most of the homegrown stuff is from other people’s garden. Homebrew is a powerful bartering tool! 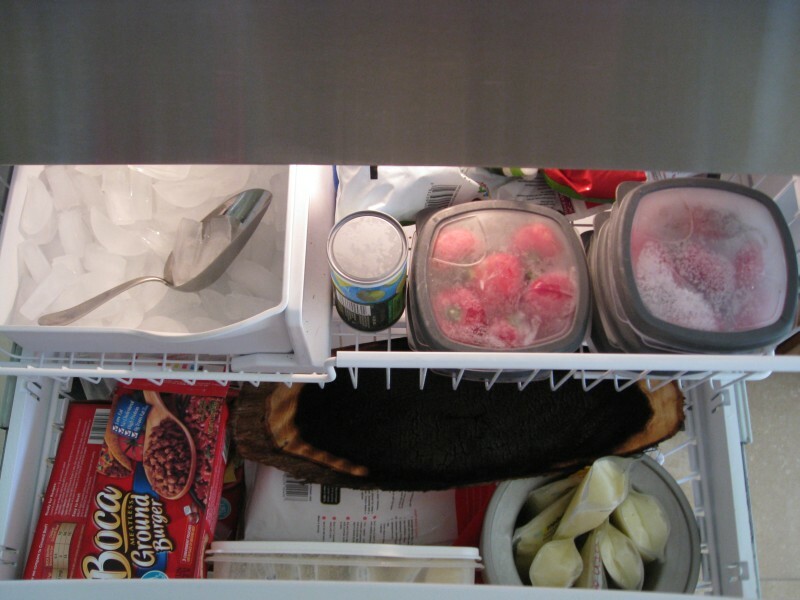 The bottom shelf is soymeat (crumbles make a really yummy marinara additive), Extra frozen veggies, frozen fish, lots of frozen milk for Ainsley, an ice cream maker, and a big chunk of charred wood. Wha? What idiot puts charred wood in the freezer? Well, it’s my salmon grilling plank and although I rinse and scrub it after use, I just don’t think plain water can rinse off all of the bacteria that could fester before the next time I use the plank. I guess I didn’t realize the large amount of insanity that goes into my fridge. It is a very small refrigerator, so I really have to be creative with the space. It is not very deep, which is really a big advantage; it’s much harder to lose a container of leftovers, only to find it six months later covered in fuzz. The biggest thing I noticed was that I am doing a pretty good job of keeping it neat. I used to throw away a lot of rotten food- what a waste of money and resources. Having everything organized has helped me use everything before it rots and also feels less cluttered. 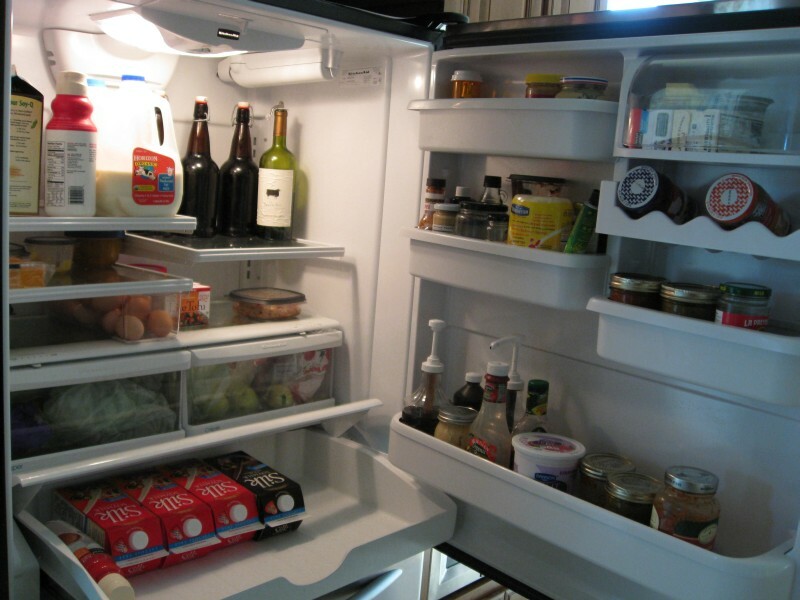 I’m always jealous of fully-stocked and organized fridges. Everything would just go bad around here, since we don’t eat that much. Your fridge confuses me. It’s not just the bottom drawer freezer thing; I never knew you had that drawer where you’re hiding the Silk! And I can’t tell you how long I looked for your medicine in the door that one time. Maybe I should let myself be inspired about less waste by moving to David’s smaller fridge. But I do like to stock up on items that last a long time when they are on sale and so I don’t have to go to the store as often. Shopping right is buying produce every week and a half and the rest of the stuff only monthly! I like the idea of being inspired by the smaller fridge. It can be a good challenge. And who knows; maybe he has a sneaky, hiding drawer like mine! Thanks for sharing your fridge. i love the soy crumbles, too.